Have you ever considered collecting carnival glass. This wonderful glass was made in the early 1900’s and reproduced in the 1970’s. The early glass has a coloring and patina of its own. As a collector, I have learned to recognize the “old” verses the new glass by the coloration and feel of the glass. And as a collector, I’m always interested in collections coming on the market at auctions. In my opinion, he best collections are those offered at carnival glass conventions by long time collectors who are selling their entire collections although I’m sure they still have a piece or two at home. I received the Jim Wroda Auctions catalog yesterday with photos of the glass offered at the ACGA 2015 Carnival Glass Convention auction June 19 and 20. The brochure left me wanting to catch a plane to Ohio. Visit their website http://www.jimwrodaauction.com for a complete auction listing. I especially liked the Hobstar Pickle Caster with frame. A truly rare piece. The International Carnival Glass Association convention is in St. Louis, Missouri July 15-18, 2015. This also promises to be a fantastic convention. The theme of this years displays is Decorated Carnival with hand-painted decorated pieces on display. For more information on this convention visit http://www.internationalcarnivalglass.com. 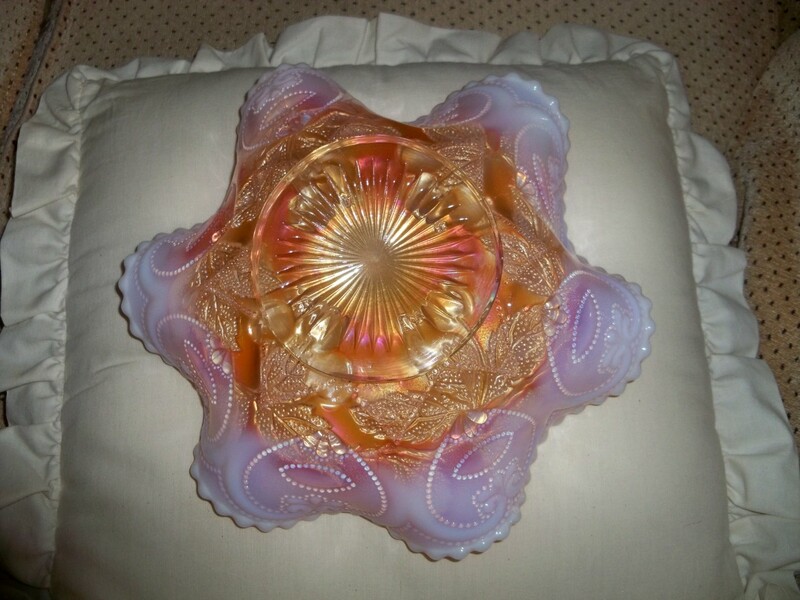 And now one of my favorite pieces from my collection – Dugan paneled cherry peach opalescent bowl with jeweled heart pattern exterior. Morris Appraisal Service was established in 1999 after relocating from Oklahoma City to Carrollton. Beverly Morris is a Certified Appraiser of Personal Property by the International Society of Appraisers, the largest personal property society in the United States. Our services include appraisals for insurance, divorce, equitable distribution, estate taxes, donation, damage claims, market values as well as consultations regarding sales of property and other needs. I also a speak for various antique clubs and organizations. What are the most common residential items that people in Texas are having appraised? Many insurance companies are now requiring insurance appraisals for antique furniture, silver, art, jewelry and other high value personal property. It is best to check with your agent to determine if an appraisal is needed. Individuals also request appraisals for special collections that may be insured apart from their homeowners policies. Although I do not appraise art and fine jewelry, I am always willing to refer a person to a specialist in that field. Why is it important to have these items appraised and how is the appraisal info typically used? Appraisals are typically used for obtaining insurance, determining the value of what the person has, selling property, pre-move and post-move insurance and damage claims, estate planning, equitable distribution among heirs, equitable division for divorces and donations. An individual may also consult an appraiser before buying a piece of antique furniture or fine art. What qualifications should a reliable appraiser have? A qualified appraiser will have membership in an appraisal association recognized by the government. All ISA appraisals are written to the U. S. Government’s Uniform Standards of Personal Property Appraisal. This standard is updated every two years and appraisers are required by ISA to attend an updated courses every two years. Upon joining ISA new members are required to take courses with examinations. These courses include the Core Course in Appraising which teaches the basics of what is an appraisal, ethics, business practices and communications, identification and authentication, research, terminology, report writing, legal aspects of appraising, expert witness, and IRS report writing. In addition to become an Accredited Member the person must complete a specialty course in their field, ie. Antiques and Residential Contents, Gems and Jewelry or Fine Art. Certified members are required to have a certain number of years experience, show 500 actual billable appraisal hours, and pass a five hour written exam. Members are required to re-qualify every five years through coursework and must show 100 hours of actual work and additional courses completed in their field. A person seeking an appraisal should ask for a professional profile and see if the individual is a member of an appraisal organization, look at the person’s experience and ask questions about the appraiser’s ability to appraise their property. As a generalist appraiser I often call on other appraisers to work with me on a report. If an individual has books, I call on a book appraiser to do the books while I do the other property and combine our reports into one document which both of us sign. If I just consult with another appraiser, I may or may not put this in the report, however, it is in my work file. What happens if an antique, work of art or another item is appraised at a different value than the owner thinks it’s worth? We all think our antiques have a certain value. Market trends, demand, condition, fashion fads and desirability all affect value. It is up to the appraiser through research and presenting the material to explain to the client how the value was established. As an appraiser all of my comparables and notes are retained in a work file so if there is a question beyond what I have put in my cover letter, I can respond to the client. I receive many calls from people wanting an appraisal to sell their property. Often after talking to the person, I refer them to certain web-sites and to visit antique malls as the value does not merit the expense of an appraisal. In addition to written researched appraisals there are verbal appraisals. Verbal appraisals are based on experience and do not include research unless I determine it is in the client’s best interest for me to come back to my office and do some quick research. Fees are hourly and I work by appointment. If you have valuable items in your home that you would like appraised call me or check the North Texas Chapter of ISA website to find an appraiser in your area. If you live in another state go to the International Society of Appraisers website and the “Find An Appraiser” for a listing in your city or state. If you call me and this is not something I feel I am the best person to appraise the property, I am always happy to refer you to another appraiser.